Place ginger slices in pan immersed in orange juice, add carrots and salt. 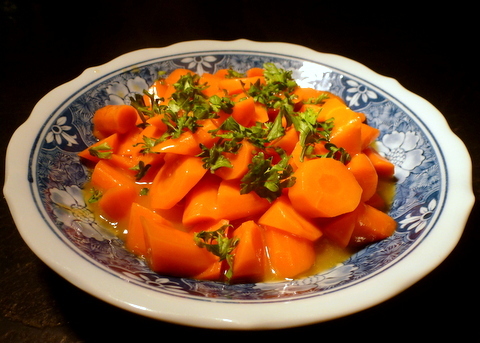 Cook carrots for 5 - 6 minutes or until tender. Remove ginger slices. Add Earth Balance or butter and honey. For thickening: Mix 2 tablespoons orange juice with 1 teaspoon arrowroot or cornstarch. Stir into carrot liquid over medium heat just until it thickens. Add a squeeze of fresh lemon juice to the carrots. Coat the carrots with the glaze and serve.